I am currently down to my last three cupcake guitar pick pieces. I have sold out of the earrings but have two pairs of hair clips and a dangle bracelet available. The guitar pick pendants are embellished with a "Cherry" gem. 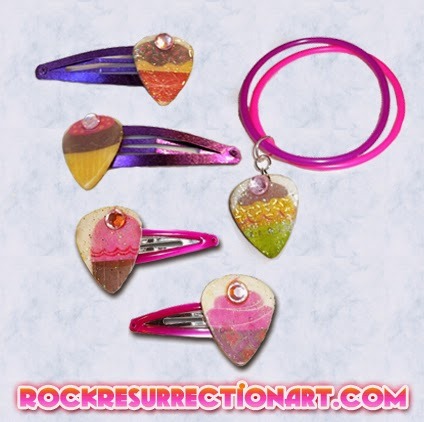 Clips are metallic purple metal and hot pink plastic and metal. Bracelet is shinny Pink and Purple rubber. The bracelet is posted in the store and the hair clips are now available in the shop. These are the last of their kind, I don't have anymore cupcake card stock material (for now anyway). So make sure you get them now before they're gone!